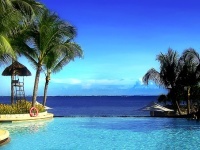 The island archipelago collectively known as the Philippines is one of Southeast Asia's less explored tourist jewels. Although in the past safety concerns and faltering infrastructure have kept tourists at bay, a concerted effort at revitalising the tourism industry on the part of the Filipino government has seen a dramatic increase in the number of annual visitors in recent years. The gorgeous island chain offers plenty to see and do, from lazing on palm-fringed beaches to world-class scuba diving and snorkelling sites, and a wealth of great cultural attractions in between. Visitors to the Philippines can generally be grouped into two categories: package-tour holidaymakers, visiting one of the Philippines' excellent beach resorts (found in Bohol, Boracay or Puerto Galera); and independent adventure travellers, keen on criss-crossing the archipelago in search of excitement. Whichever way visitors decide to experience the Philippines, there are several tourist sights and activities that one simply can't afford to miss. Manila, the capital, is a chaotic yet compelling city, with plenty to keep travellers occupied. Visit Intramuros, the historic walled enclave full of Spanish-colonial architecture, and Binondo, the one of the oldest and most vibrant Chinatowns in the world. In terms of natural wonders, the Philippines abounds with unforgettable excursions: from the marvellous Chocolate Hills of Bohol and miniature Tarsier monkeys, to the Puerto Princesa Subterranean River National Park (one of the New 7 Wonders of the World), nature-lovers will delight in the Philippines's lush, captivating landscapes. The Philippines has a tropical climate characterised by distinct rainy and dry seasons. Weather-wise, the best time to visit the Philippines is between November and April; however, be warned that this is also peak tourist season, and so accommodation and flight prices will be higher. Read more on the Philippines' Climate and Weather. -Fort San Pedro offers some fascinating insights into Spanish colonial rule in the Philippines. -The Chocolate Hills, a vast plain consisting of 1,776 conical hills formed from grass-covered limestone, is a geological marvel. -The Taal Volcano is a must-see natural attraction, and is accessed from the holiday hotspot of Tagaytay City. -Explore the enclave of Intramuros, Manila's oldest district, and be amazed by the thick walls and rich history surrounding Fort Santiago. Read more about Philippines Attractions. -A trip to the Puerto Princesa Subterranean River National Park, located on the island of Palawan, is a must for visitors to the Philippines. -Explore the archipelago's incredible coral reefs and rich marine life by going diving at world-class sites in Boracay, Cebu, or Palawan. -Go shopping in Binondo, Manila's Chinatown, before eating in one of the district's famous converted movie theatre restaurants. -Don't just settle on one island, see them all by heading out on the numerous island hopping tours available in the Philippines. Read more about Philippines Activities. Cheap flights to the Philippines are easy to find from American and European destinations, although the only direct flight from the US to Manila is from San Francisco. Visitors who plan to visit the central or southern Filipino islands (such as Palawan, Bohol, Boracay and Mindanao) should think about purchasing an 'open jaw' ticket, which will see them fly into Manila and then out of Cebu. Get more information on Philippines Airports. Dusk by F. Sionil Jose, Dogeaters by Jessica Hagedorn, and Cebu by Peter Bacho. Lechon (whole-roasted suckling pig), puchero (beef prepared with banana and tomato), kare-kare (oxtail cooked in peanut sauce) and adobo (chicken, pork or squid stewed in vinegar, soy sauce, garlic, peppercorns and bay leaves), or try balut - the national delicacy. Tanduay Rum, mixed with fresh fruit juice. Hand-woven bags, baskets and mats, embroidered shirts and skirts, hammocks and bamboo flutes. Pack sunscreen and lightweight clothing, as well as a small, ideally waterproof, backpack that you can take with you on day excursions to hold necessary items (such as bottled water, antibacterial hand-soap, toilet paper, insect repellent). The nine-day Sinulog Festival, held in January in Cebu City, is a colourful celebration featuring traditional dance performances, processions, street music and more. Visit the island of Marinduque for the 200-year-old Moriones Festival (April), where locals recreate the story of Saint Longinus. Cebu's Fête de la Musique (June) is a fantastic event, featuring 150 bands playing on seven different stages. More information on Philippines Events. -The Filipino flag is the only flag in the world which is flown upside-down during times of war. -About 350 to 400 million text messages are sent every day in the Philippines, which is more than the US and Europe put together. -The Philippines has more than 200 volcanoes, although many are not active. An archipelago blessed with great weather and astounding natural scenery, the Philippines is emerging as a great destination for snorkelling and diving enthusiasts, as well as an all-action stop on the southeast Asian backpacking circuit.